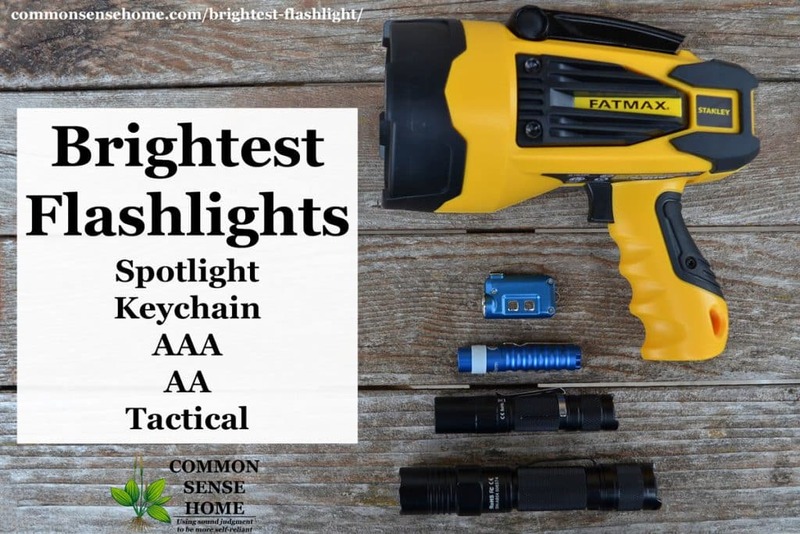 These are our recommended brightest, affordable, single battery AA, AAA, 18650, keychain and handheld spotlight flashlights. 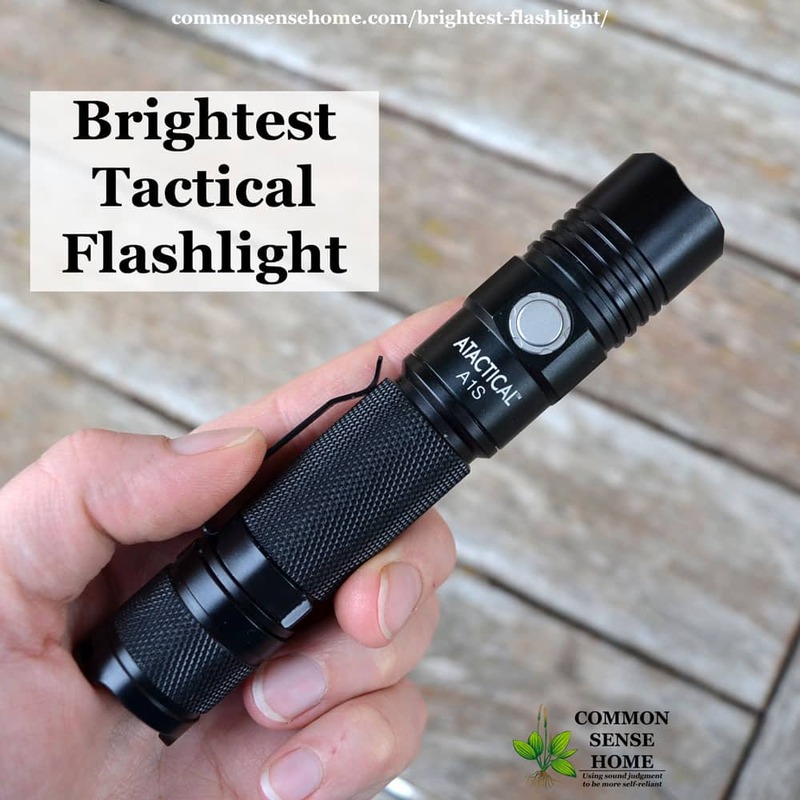 They are great for a every day carry in a pocket, purse, glove compartment, backpack, first aid kit, or any situation where you need a small, affordable, very bright LED flashlight. These are the brightest flashlight for each type and size of battery. 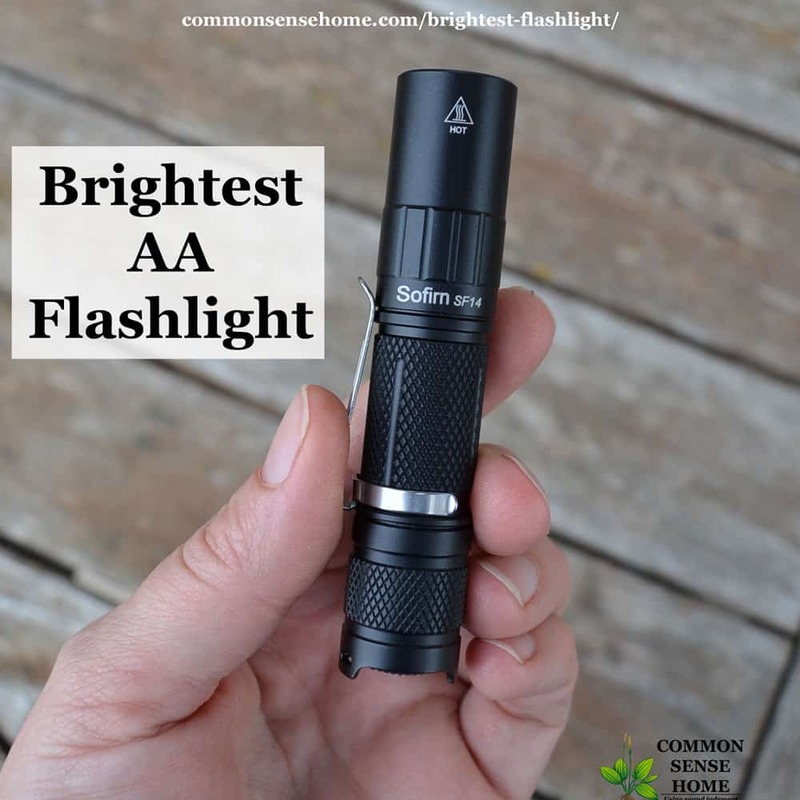 What is the brightest flashlight that uses one AAA battery? The 120 Lumen LED LUMINTOP EDC01 is our favorite small AAA LED flashlight. On/off and modes are controlled with a twist end that has 3 modes; low, med and high. The Lumintop EDC01 is the brightest AAA flashlight we have tested. It can be used as a AAA keychain flashlight, and the proof is that it survived daily use on August's keychain for over a year. This small AAA flashlight isn't much bigger than the AAA battery inside it. It is a tiny powerhouse that is very well rated on the internet, and we recommend it without question. Duncan loves the blue one, in fact I had to order an extra one because the little blue AAA Lumintop was claimed by him. The run time is great and its quite bright, especially if you combine it with a good high mAh rechargeable AAA battery and a AAA battery charger – see our post Best Rechargeable Batteries and Chargers for more info. What is the brightest flashlight that uses one AA battery? The 500 Lumen LED Sofirn SF14 is our pick for the best and brightest AA flashlight. With a single good AA battery it is 500 Lumen, and it can get to 600 Lumens if you use a 14500 battery (actual is about 100 lumen lower on both). Even with a standard AA battery, it is still much brighter than our best cheap flashlight recommendation (and about 1/2 the PD35). The SF14 link also has the previous model for a few dollars cheaper but we don't recommend it, if you want a good flashlight get the slightly more expensive one for the extra lumen. See our related post: Best Cheap Flashlight if you want one that is not as bright but 3x less expensive. What is the brightest key chain flashlight? The 360 Lumen Nitecore TINI 380 Lumen USB Rechargeable Keychain Flashlight is crazy bright. 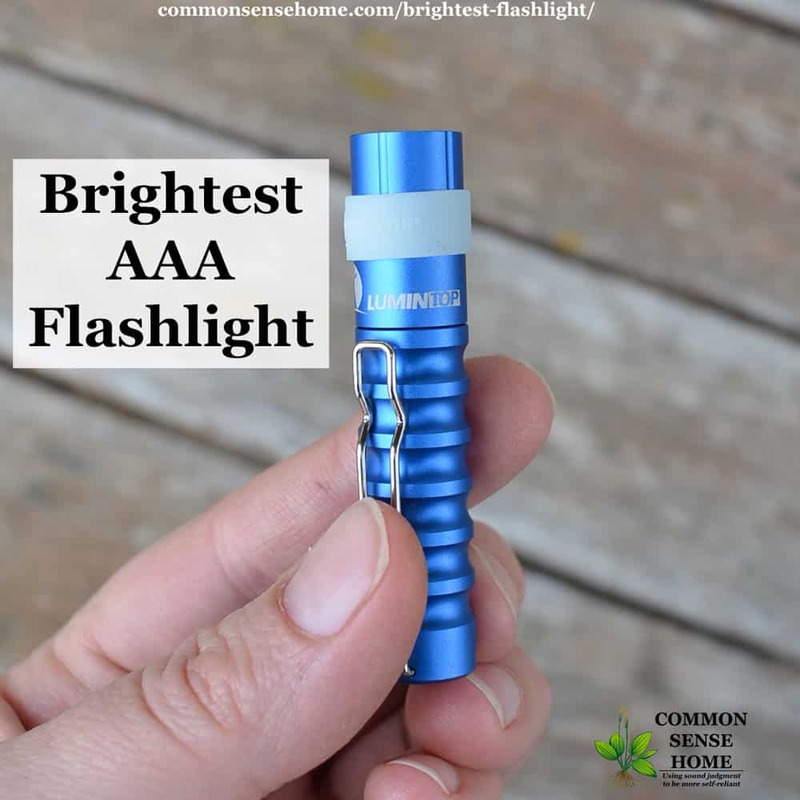 It is far and away the best keychain flashlight we have ever used because it is the brightest keychain flashlight we have ever used. The Nitecore keychain flashlight is about 2x the price of the AAA Lumintop EDC01, but as noted, this flashlight is crazy bright and small. Best feature? It recharges using micro USB! No external batteries required. It has been on August's keychain for over a year now and it is holding up extremely well (the paint is off in a couple spots in the picture). This is brightest small flashlight we have, hands down. Note: The charge does get used up fairly quickly if you run it at max lumen power. 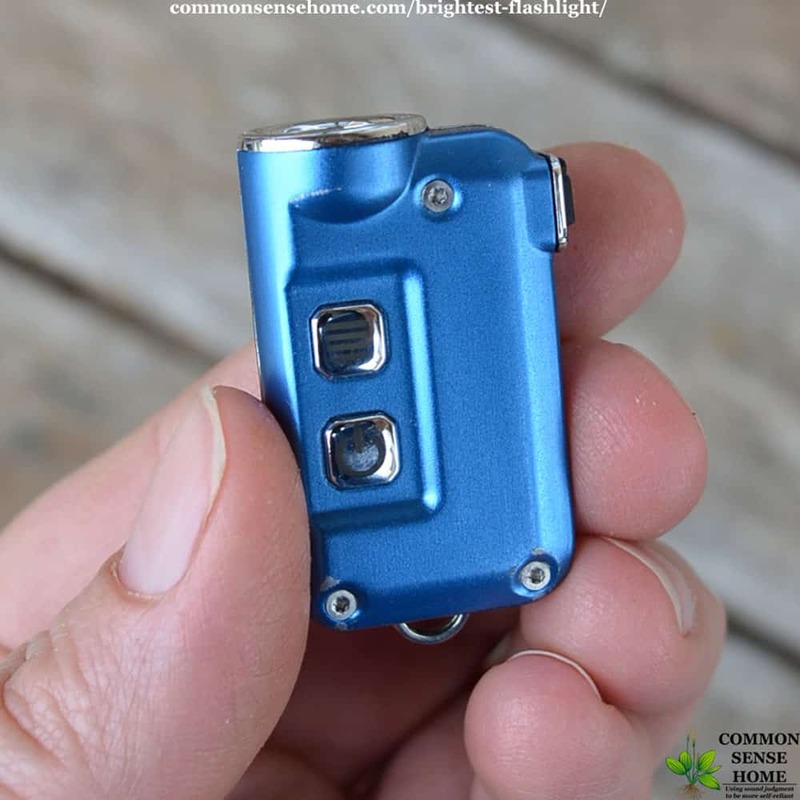 But even at lower 35 lumen it's so bright it's easy to see around in a completely dark room with this tiny keychain flashlight. The Thrunite TN12 1050 lumen Neutral White LED is excellent for the price. If you want maximum brightness, get the cool white. If you want natural colors, get the Neutral White. This is a 6 mode (Firefly/Low/Medium/High/Turbo/Strobe). It remembers the mode, is tough and really throws the light. The manufacturer says the light will reach 600ft+ but in our use we were closer to 450ft. You will need an 18650 charger such as the inexpensive USB XTAR VC4 Charger and a couple of 18650 batteries such as the Orbtronic 18650s. There are a few other 18650 flashlights that are brighter, but for the price we recommend the TN12 as the brightest 18650 flashlight for the money. It is tough and super bright flashlight for the price. For more information on 18650's see this post: What is an 18650 Battery? ** Previously we recommended the ATactical A1S but it is no longer available. See “Alternatives for the aTactical A1S 1150 Lumen Flashlight” for more options. What is the brightest handheld spotlight? This is not a pocket or EDC flashlight. The 920 Lumen Stanley Fatmax handheld rechargeable 10w LED powerful flashlight is fantastic. We needed a flashlight that would reach out 400+ yards to the back of our 10 acre parcel and this light met our needs. 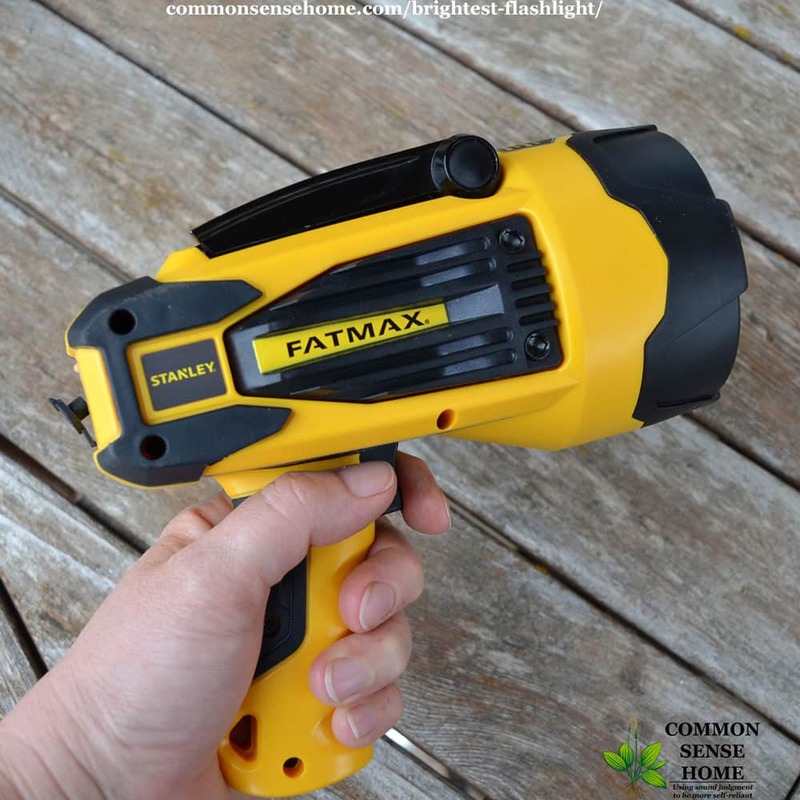 The beam distance of the Fatmax is great. It lights up the back hill. (Which surprised the deer.) The charger works well and so far it doesn't seem to have battery memory. We didn't receive any of these flashlights for free. We purchased, tested and used them all ourselves after comparing many online flashlight reviews. 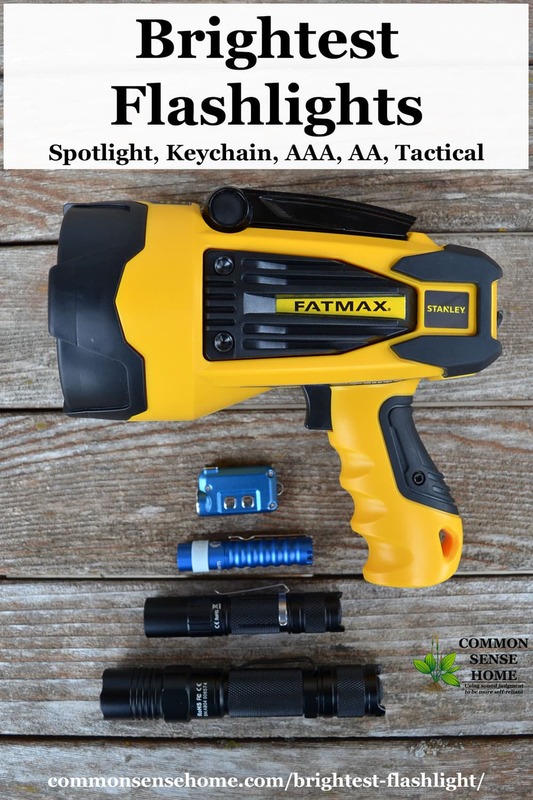 When we were looking for the brightest LED flashlight, they had to be reasonably priced, durable, very bright and either use standard AA, AAA or 18650 batteries or included a rechargeable battery inside the flashlight like the FatMax and Tini380. We wanted an affordable price, because flashlights disappear into the same spot missing socks disappear. And we needed them durable because they get dumped in glove compartments, left in first aid kits, kitchen drawers, trunks of cars or lost in the bottom of a drawer. They need to be small enough that we will actually carry them around in the purse, pocket or on a key chain, very bright and not so expensive that we would freak out if we lose them. So size, brightness, cost and battery type were the things we measured to pick our top 5 brightest affordable flashlights. There are a lot of good flashlights out there, and some really crappy ones. We have bought some of the junk ones (they aren't on this list). The five still on the list are great to excellent.